The shooting by a white supremacist at Charleston’s Emanuel AME Church in June 2015 was a wakeup call for poet Marcus Amaker. The gunman killed Rev. Clementa Pickney and eight parishioners during a Bible study in the basement. “I think that for a long time a lot of people my age thought racism was not really this tangible thing. But then when this happened at the church, it really became the most real thing that we’ve ever experienced,” said Amaker. At first glance, the two couldn’t seem more different. Wentworth is a high-energy, middle-aged white woman, who lived in Massachusetts and New York before moving to South Carolina 27 years ago. Marjory Wentworth is the Poet Laureate of South Carolina. Photo by Andy Allen. Amaker is a young African-American graphic artist and web designer with long braids, a broad smile and easy going manner. He grew up an Air Force kid, living all over the world before coming to Charleston in 2003. They even collaborated on a poem, after incoming Mayor John Tecklenburg commissioned one for his inauguration last January. The result was “Re-imagining History” which tells of Charleston’s complicated history of slavery and race relations. The final stanza recalls the tragedy of the shooting. so we stepped off the track and began to walk. Both poets were immediately contacted by local media to write poems in response to the shooting. Wentworth had just two days to compose the poem “Holy City” — the nickname for this community with over 400 churches. “I wanted the poem to feel like a prayer. I wanted it to be something that everybody could read and relate to somehow,” Wentworth said. 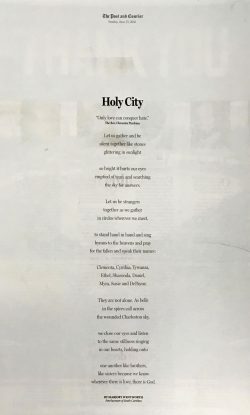 The poem was published on a full page in the Sunday edition of the Post and Courier. Amaker wrote his poem “Black Cloth” for the weekly City Paper. He said he wanted it to be a tribute to the nine victims, but also wanted it as a wakeup call. “For me, it feels like the time for small talk is over. If we don’t change after this, then what is going to change us?” Amaker asks. In the days and weeks that followed, poets from the community and around the country began sending poems to Wentworth and Amaker. In response, the two created a website for the poetry and eventually hope to publish a book. “In a time of crisis, poetry is a great way to find the language for something that people don’t have. People crave some way of articulating what they’re feeling. And that’s what poetry does,” says Wentworth. wherever there is love, there is God. let us no longer walk in your shoes. a misguided soldier who’s trying to start a war. heaven was as close as your breath that night. and speak the light that flows from love. with the dirt of intolerance. where seeds of faith continue to grow. for the unity of the Holy City. the dusk of pain, the lightlessness of the dawn. Marjory Wentworth is the poet laureate of South Carolina. 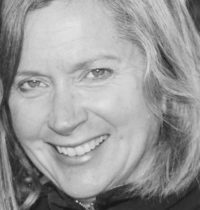 She has taught creative writing at the Art Institute of Charleston and at Charleston County schools for nearly 25 years. 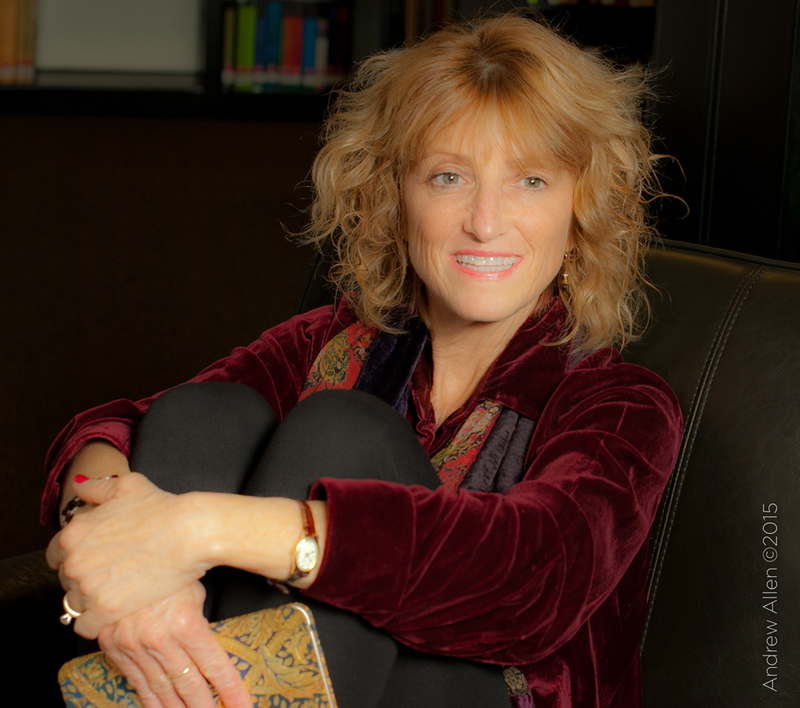 Her work has been published in numerous magazines and anthologies and her books of poetry include “Noticing Eden” and “The Endless Repetition of an Ordinary Miracle.” This month she is releasing a non-fiction book called “We are Charleston.” In it, Wentworth and co-authors Herb Frazier and Bernard Edward Powers, examine the reaction of the city following the shooting at the Emanuel AME church one year ago. 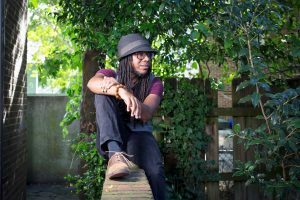 Marcus Amaker is an award-winning web designer, graphic designer, videographer, musician and author. Amaker began his career as a journalist, working for the Post and Courier newspaper. He has released seven books of poetry, his most recent is “Mantra: an Interactive Poetry Book.” His poems have also been featured in “Home is Where: An Anthology of African American Poetry from the Carolinas”, “Seeking: Poetry and Prose Inspired by the Art of Jonathan Green” and “My South: A people, A Place, A World of its Own”. As a spoken word poet, he’s performed for the MOJA, Piccolo Spoleto, Spoleto and North Charleston Arts festivals. Left: Marcus Amaker is a poet, graphic artist, web designer and musician. Photo by Jonathan Boncek.